New Delhi: In the second part of Operation 136, Cobrapost has exposed owners and high-ranking personnel of more than two dozen media houses, both mainstream and regional, the biggest ones and the smaller ones, the oldest ones and the newer ones. ‘Operation 136: Part II,’ in fact, shows Indian media’s underbelly in its most visceral form, where even the “big daddies” do not mind agreeing to undertake a campaign that has the potential to not only cause communal disharmony among citizens but also tilt the electoral outcome in favour of a particular party. This they will do if they are paid the right price, and sometimes they have no compunctions to quote a price as high as Rs. 1000 crore, as did the Times Group owner Vineet Jain, while others showed a propensity to indulge in any kind of illegality bordering on criminality. The media houses agreeing to run the campaign are Times of India, India Today, Hindustan Times, Zee News, Network 18, Paytm, Bharat Samachar, Suvarna, Bartman, Dainik Samvad, Star India, ABP News, Dainik Jagaran, Radio One, Red FM, Lokmat, ABN Andhra Jyothy, TV5, Dinamalar, Big FM, K News, India Voice, The New Indian Express, MVTV and Open magazine. We have received an exparte stay order from the honourable Delhi High Court on the evening of 24th May, 2018, which debars us from including the Dainik Bhaskar Group in our investigation. The honourable High Court has passed the injunction in favour of Dainik Bhaskar without hearing our side of the case, and we shall consequently be challenging the court order in the interest of truth and justice. Senior Investigative Journalist Pushp Sharma used the same cover and the same ruse! Wearing the garb of a seasoned Pracharak, Sharma adopted malleable identities which he used according to the situation at hand. He first used his association with an Ujjain-based ashram, claiming himself to have been schooled at Jhunjhunu, Rajasthan, to have studied in IIT Delhi and IIM Bangalore, settled in Australia and to have been running his e-gaming company out of Scotland. Sometimes, he claimed to be the head of the Madhya Pradesh unit of Om Prakash Rajbhar’s outfit, Suheldev Bharatiya Samaj Party, charged with party affairs in Karnataka, Maharashtra and the Northeast. At times, the journalist used all his assumed identities in a single meeting. As the investigation evolved to take on a pan-India character, he assumed the identity of a representative of a fictitious religious organization, Shrimad Bhagwad Gita Prachar Samiti, purportedly on a mission, a gupt vyavastha (secret arrangement), at the behest of the “Sangathan” to bolster the prospects of the party in power in coming elections. The journalist approached these media houses with his hideous proposition. As he offered them a fortune in return, Cobrapost saw them all crumble under the weight of a “big business opportunity” that was knocking on their doors without asking. Almost all bent themselves backward to grab this opportunity. However, there were two notable exceptions, Bartaman Patrika and the Dainik Sambad, which refused to play ball. No amount of cajoling or inducements could bring them around. Then, the campaign will be geared up to polarize the electorate on communal lines by promoting speeches of Hindutva hardliners, the likes of Vinay Katiyar, Uma Bharti and Mohan Bhagwat, among others. Many of them were ready to accept unaccounted cash, in other words, for the job to be assigned to them. Some of them agreed to route cash through a third-party agency to turn it into white, even suggesting hawala routes such as Angadiyas. Some of the owners or important functionaries admitted that they were either associated with the RSS or they were pro-Hindutva and would thus be happy to work on the campaign, forgetting the cardinal principle of journalism: neutrality. Some of them agreed to plant stories in favour of the party in power in their publications, while others were ready to unleash their investigative teams to rake muck on opposition leaders. Many of them agreed to develop content for this invidious campaign by employing their own creative team. Almost all agreed to run this campaign on their platforms – print, electronic, FM radio or digital in its various avatars such as e-news portal, e-paper or social media such as Facebook and Twitter. Some of them even agreed to run down Union ministers Arun Jaitley, Manoj Sinha, Maneka Gandhi and her son Varun Gandhi, among others. Many of them are ready to run the content in such manner as would not look like paid for. Almost all FM radio stations agreed to allow their customer to monopolize their free air time. Many FM radio stations also agreed to use RJ mentions to promote the agenda: Hindutva and character assassination of rivals. Operation 136: Part II is unique in the sense that it not only has exposed all these media houses but has also brought to the fore the fact that in a technology-driven age an agenda can find a mobile app a very effective medium to reach out to millions of users. Our expose of Paytm does exactly that. It brings home the point that one does not need an elaborate arrangement of the conventional media such TV channels or newspapers. A simple mobile app can achieve what the conventional platforms cannot: it can deliver the message with a blink of an eye. In fact, our interaction with top Paytm honchos is quite revealing in many respects, for it not only shows the company’s affinity to both the BJP government and its ideological fountainhead RSS, but also shows that users’ data can be compromised. As India has slipped two paces to 138 from its position of 136, as this investigation was underway, in World Press Freedom Index (https://rsf.org/en/ranking#), Operation 136 has found that most of the media houses are either owned by politicians themselves, particularly the regional ones, or patronized by politicians, and it is natural for them to become their masters’ voice. It was high time we coined a new phrase to define this journalism as crony journalism a la crony capitalism. For instance, ABN Andhra Jyothy, a prominent Telugu TV news channel is patronized by TDP supremo Chandrababu Naidu. It is no surprise if we hear its Chief Marketing Manager E.V. Seshidhar say: “We have very good connects with TDP … We have do [sic] lot of what do you call we have main official what do you call for AP government Andhra Pradesh government, we have official event telecaster rights for Andhra Pradesh government.” While this connect goes beyond the TDP, to include the BJP and other outfits, Seshidhar even goes to say that their newspaper Andhra Jyothy holds so much sway that they could influence the outcome of the Karnataka elections. While the journalist had a tough time in convincing Ajay Shekhar Sharma of Paytm that he was there to fulfill the assignment received directly from the Sangathan under a “gupt vyavastha” or secret arrangement, the senior vice president of the mobile-app utility payment company candidly admitted his association with the top brass of both the RSS and the BJP. Taking his prospective client as someone belonging to the Sangh Brotherhood, he made a very shocking revelation. Referring to the stone pelting in Kashmir last year, Ajay Shekhar said: “Jab JK mein band huye the na pathar … toh humari personally PMO se phone aya tha kaha gaya tha ki data de do ho sakta hai ki Paytm user hon (When the stone-pelting stopped there in J&K, I personally got a phone call from the PMO. They told us to give them data saying maybe some of the stone-pelters are Paytm users. )” Paytm users may now be wondering if the company has violated its policy of privacy and data safety! Another interesting fact that has emerged during the course of ‘Operation 136: Part II’ is that although they might be swearing by their allegiance to the RSS or the BJP, they don’t give a damn to Modi’s public stance against black money for which the Prime Minister did not back away from subjecting the entire citizenry to untold miseries by enforcing demonetization in November 2016. Punching holes in what has been gloried as “surgical strike” against black money, we found Vineet Jain, Managing Director of the Times Group, and his aide Executive President Sanjeev Shah, naming some big corporate houses which could help make black money squeaky clean and even suggesting to employ the services of ‘Angadias’—a Gujarati name for hawaladars or hawala operators of illicit money—to get the job done. While Vineet Jain says, “Aur bhi businessmen honge jo humein cheque denge aap unhe cash de do (There are other businessmen who would give us cheque against the cash you may give them), his aide Shah informs us: “Who will take that from him in Delhi suppose if Goenka says I want it in Ahmedabad so that I Angadia will have contact in Ahmedabad where they will exchange in number on a note or whatever.” Hope our Prime Minister and other arms of his government are listening! We know it well that such open confessions of their allegiance to the ideology of the RSS could be brushed aside as personal opinions, but given the position they hold in their respective organizations what they say cannot be taken lightly. The reason is that it is rather the business interests that have an overarching influence on the editorial policy of a media organization, and Operation 136 has once again shown it in ample measure. The first part of Operation 136 had exposed India TV, Dainik Jagaran, Hindi Khabar, SAB TV, DNA (Daily News and Analysis), Amar Ujala, UNI, 9X Tashan, Samachar Plus, HNN Live 24×7, Punjab Kesari, Swatantra Bharat, ScoopWhoop, Rediff.com, IndiaWatch, Aj and Sadhna Prime News. All these on-camera confessions make it clear that the malaise of paid news has set in deep as it is no longer confined to a few individuals who would show no scruples while publishing paid content, camouflaging it as news stories or reports. Over the years, paid news has become institutionalized, as this investigation establishes, for no one in authority in news business would receive an agenda, which is overtly communal and defamatory, with enthusiasm, let alone committing to undertake it, particularly when there are clear-cut guidelines to follow and laws to abide by. The Indian Penal Code (IPC) has well laid-down provisions, for instance, to deal with various unlawful acts that these media houses agreed to commit. Section 153(A) makes any attempt to “promote disharmony or feelings of enmity, hatred or ill-will between different groups” punishable with imprisonment for a term of three years or a fine or both. Section 295(A) of the IPC also provides for the same punishment to be meted out when an individual deliberately, and with malicious intent, hurts the religious feelings of a community. Then, Chapter IXA of the IPC deals comprehensively with offences related to elections. Section 171 of the IPC makes interference with the free exercise of electoral right, in any form, punishable with an imprisonment of one year or fine or both. These provisions of the IPC, thus, ensure that the offence of polarizing a group on the basis of religion, caste or community is punished. The provisions of Chapter IXA of the IPC with regard to free exercise of electoral rights are overarching in their ambit as they are also relevant paid news to influence voters to gain electoral benefits. In addition, the provisions of Cable Television Networks (Regulation Act) 1995, along with Cables Rules, and Representation of People’s Act, along with Conduct of Election Rules, make paid news and communal polarization for electoral gains an offence. Both the Cable Act and the Cable Rules prohibit transmission or re-transmission of programmes that do not conform to the advertisement code. While Rule 6 of the Cable Rules prohibits programmes of communal nature or that promote anti-national attitudes, Rule 7 also lays down the advertisement code prohibits publication of advertisements of political or religious nature. Rule 7(10) of the Cable Rules further states that “all advertisements should be clearly distinguishable programmes, viz., use of lower part of screen to carry captions, static or moving alongside the programme”. Then, Section 125 of the RPA makes communal polarization an offence punishable with imprisonment for three years or fine or both, while various provisions of Section 123 declare an act aimed at polarization and the practice of paid news as “corrupt practices” making election of a candidate null and void. Apart from these and other legal provisions, there are “Norms and Guidelines on Paid News” of the News Broadcasting Standards Authority and “Norms of Journalistic Conduct, 2010” of the Press Council of India, which all media establishments are expected to adhere to. But do they really care for such scrupulous adherence? Our investigation says no. 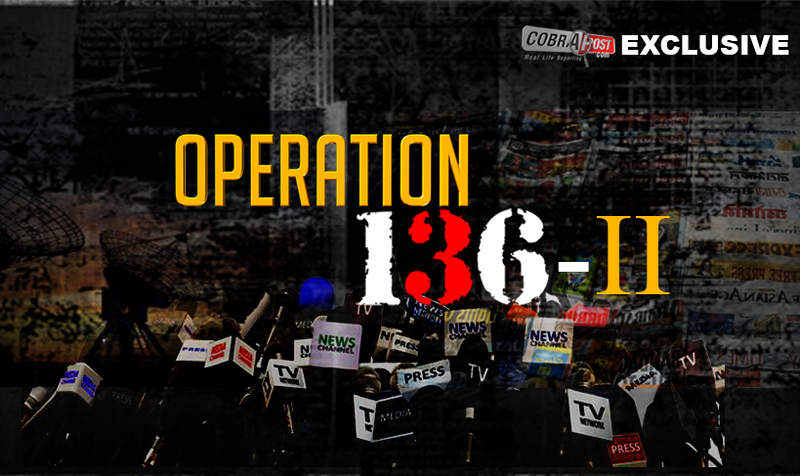 We would like to make it clear that Operation 136 should in no way be taken as an effort to undermine Indian media or question its sanctity as an institution. Our investigation does not intend to cast any aspersions or pass judgment, either, on the journalists who are working in these media platforms. They have done good journalism in the past and will do so in future. However, if the management indulges in paid news, in all its gray shades, it creates a very difficult atmosphere for the journalists to ply their trade in. This story aims to underline our earnestness to address the malaise that has been dogging Indian media for the past three decades or so and look within to make course correction, so that the faith of India’s citizenry in this vibrant pillar of democracy is not dented.